Local consulting engineer, Crofton Design, was called upon to create a fitting experience to continue the legacy of The Few who served in the Battle of Britain. 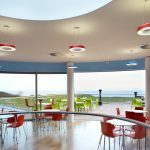 Spectral’s IRIS fitting has been installed in the Battle of Britain Memorial Visitor and Learning Centre (BoB) at Capel-le-Ferne near Folkestone in Kent. Providing stunning illumination for visitors to the memorial, the shape and colour of IRIS is in keeping with the circular theme of the space. Local consulting engineer, Crofton Design, was called upon to create a fitting experience to continue the legacy of The Few who served in the Battle of Britain. The new building is formed in the shape of Spitfire wing, the iconic WWII aircraft, giving an immediate impact on visiting the site and providing a truly memorable visitor experience to honour The Few. 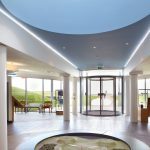 The entrance features a central circular foyer and reception area that leads onto two ‘wings’. On one ‘wing’ is a small retail area that opens out into a teaching and learning space for educational field trips to ensure this important part of our Nation’s legacy is remembered for years to come. The other ‘wing’ contains a sensory audio visual experience of events that pilots went through during the Battle of Britain. Due to the lack of straight edges in the building, a number of challenges were presented to the lighting design team at Crofton Design. 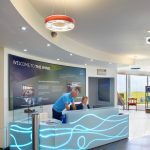 The plan was to try and steer away from a ‘safe’ design that had been done at many other visitor buildings and achieve something a bit different. 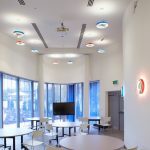 However, being a charity almost entirely self-funded from donations, the lighting design had to be both cost effective, but also economical to run in the long term. In the circular main foyer, the formal part of the lighting design spans out in a set of concentric rings using high efficiency downlights. This circular theme was then carried through into the cafeteria on the first floor above, and also through into the retail and learning zone. The luminaire’s diffuser is formed from a single sheet of ultra-transparent material to provide maximum lighting efficiency, while the radial prisms control and direct the light, simultaneously preventing glare and revealing the lamp behind for added visual flair. The sides of the luminaire feature a semi-transparent reflector created from evaporated aluminium, providing further aesthetic interest as well as high efficiency. HM The Queen and the Duke of Edinburgh officially opened the Battle of Britain Memorial on 26 March 2015.